As I’m often asked this question, I wanted to look at the common ground between local and organic SEO as well as what sets them apart. Whether you have a local business or want to be found by people far and wide, this article will give you insights on how to better optimise your website. Broadly speaking, local SEO is about making your business as prominent as possible in online searches in order to bring people to a physical location. At the 2016 Google Summit, the search engine announced that approximately one third of mobile searches have a local intent – i.e. the searcher is looking for something physically located nearby. In addition, local searches on mobile devices are growing 50% faster than other searches. If you have a bricks and mortar business that relies on footfall and your SEO budget is limited, then you may want to prioritise your local SEO over organic SEO. I’ll explain more about how you can do this later. 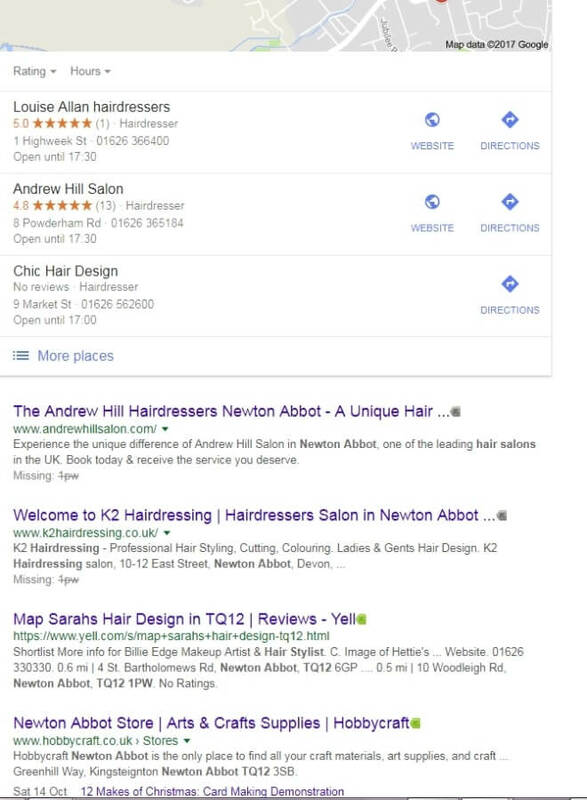 Google has a number of ways of displaying businesses with a strong local SEO presence. When you run a search for a local service, you will see what’s known as the ‘local 3-pack’ listings at the top of page one of the search results. This panel (see the picture below) shows three local businesses that best match the search intent and the searcher’s location. If the searcher clicks on the ‘More places’ option below the three listings, they will be taken to a longer list of local businesses, sorted by distance from the searcher’s location, and a view of where they can be found on Google Maps. The top two listings on this longer list reflect paid-for Google Ads rather than organic listings. Features that help local businesses stand out from others on the page include high star ratings and a larger number of Google reviews, as well as information about the telephone number, opening hours and a link to the company’s website. Organic SEO focuses on ensuring that web pages rank as highly as possible in relevant searches to bring traffic to a website. Although local businesses will still want to develop their organic SEO for visibility in searches, organic SEO without a local component particularly suits businesses that don’t rely on customers within a specific geographic location. If you want certain web pages to rank highly to customers throughout the UK, for example, or even further afield, then your concern will be less about ranking for location and more about ranking higher for your products or services than competitors who could be situated anywhere in the world. Both local SEO and organic SEO share significant common ground. High quality content, glowing reviews, links, citations, meta data, heading tags, images, and fast page load speeds will all make a positive difference, as just a few examples. Above all, local and organic SEO must both focus on providing a fantastic user experience and being as relevant to searchers as possible in order to be successful. By making your business more visible on page one of Google (organic SEO), your business should also become more visible to local customers (local SEO) and vice versa. 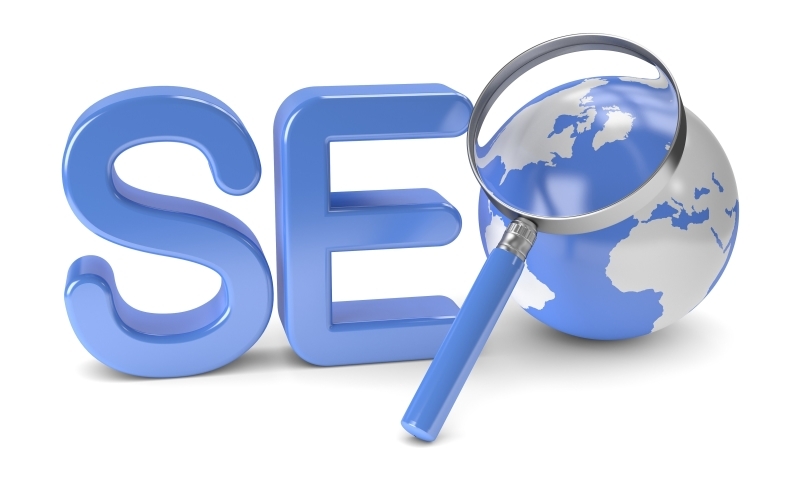 A search engine’s priority is to serve its customers – i.e. people making online searches – with results pages that are as relevant as possible to their reason for searching. In the case of local searches, a search engine will want to return a list of businesses – preferably within walking distance – that would give the searcher what they need as near to their location as possible. Google understands that if someone searches for a restaurant, takeaway, dentist, garage or hairdressers, for example, they probably have an immediate or near-immediate need for that service. They won’t want to see search results for a business located on the other side of the country/world – or even their town – no matter how fantastic or well optimised the website is. For this reason, the algorithms for searches with a local intent tend to focus on returning listings that have a local name, address and phone number (known as the ‘NAP’) and that are as near as possible to the searcher’s location. Someone making the same search just five miles away is likely to see slightly different results pages flagging up services nearer them. Search engines will still look for high quality, unique and relevant content for local businesses but these factors are arguably stronger signals for organic SEO algorithms. Another key difference between local SEO and organic SEO is that, for searches with local intent, search engines tend to add more weight to signals about the location of the business. Featuring your business’s NAP, location-specific information, local news, a Contact page including directions and a view of the business on Google Maps are all strong signals to index the location and return the website in location-relevant searches. Organic SEO focuses more on encouraging search engines to index the pages of a website and to return the most relevant pages in SERPs. A web designer, for example, who could potentially work with clients anywhere in the world would want to use organic SEO to show their knowledge, experience and skills when it comes to designing user-friendly websites. They might try to get a number of pages ranking well for key search terms in order to occupy several high ranking positions on Google or optimise for a range of different web design services to show that they can support clients in lots of ways. Local businesses, on the other hand, may try to optimise lots of different products or services for a single location. In 2016, Andrey Lipattsev, a Search Quality Senior Strategist at Google, said that ‘links and content’ were the top two most important ranking factors for organic SEO. This means that, when search engines consider where to rank one of your web pages in response to a search, they will look at the number of high quality websites that have links in their content pointing people back to you as a reliable source of further information. Search engines take each link as a vote of confidence about the authority, reputation and quality of your content. Therefore, one of the most powerful things you can do to improve your position in organic listings is to attract more backlinks from high authority domains; you can check out a website’s Domain Authority (DA) using the free Moz SEO toolbar. Backlinks are still essential to a good local SEO performance, especially if they mention your business’s location, but search engines will also look at citations and mentions relating to your location even if there isn’t an active link to your site. For local SEO, citations might occur in the form of listings in a quality online directory where your business’s NAP, opening hours and services are mentioned. Your business may also appear on local news sites or in round ups of things to do locally. These citations and mentions all help the search engines to build up a picture of your business being based at and actively operating from a given location that customers can visit in person. In the case of local SEO, citations may be as important as links because Google wants to know that it’s not sending local searchers on a goose chase to a business that won’t be relevant to their needs. If you want to improve your local SEO then you might want to claim more listings and local directory pages to underscore your credibility. Following on from the point above, local SEO arguably focuses more on finding a business in appropriate directory listings and on Google My Business, while organic SEO is more likely to reward social media engagement. Whenever your business is listed online, for local SEO purposes it’s essential to make sure that the name, address and phone number are consistent across all directories and, in particular, match your Google My Business information. The latter is – to all intents and purposes – the ‘blueprint’ for mentioning your business online; search engines will refer back to this for accuracy and comparison. Of course, social media signals are important for local and organic SEO. The debate about whether search engines directly use social media engagement as a ranking signal continues to rage on, despite Matt Cutts – the former head of Google’s web spam team – saying that they don’t. What we do know is that, although your social media activities may not directly cause a boost in your rankings via the search engine algorithms, they can indirectly contribute to boosting other factors that are ranking signals. For example, if you write an article that generates loads of interest on social media, the chances are that more people than is typical for your blog will share it, link back to it from their own sites, visit your website and spend more time on your content. This can all lead to increases in web traffic, the length of time people stay on your site, and backlinks to the article from high authority domains. These are all recognised ranking signals. As a result, if your focus is on organic SEO rather than local SEO, you might want to direct more of your budget towards generating fresh blog articles and social media content, as opposed to adding your business to more directories. Bright Local has conducted a Local Consumer Review Survey annually since 2010. The 2016 Survey showed, yet again, that reviews are essential to businesses looking to improve their local SEO performance. Although positive reviews are important for every business, they should be a priority if you’re trying to attract local footfall. In particular, Google will look for positive reviews associated with your business NAP via your Google My Business page. If we go back to that local 3-pack listing of businesses at the top of page one of Google for searches with a local intent, we can see that Google ranks the listings by those with the highest star ratings followed by those with the largest amount of Google reviews. The search engine wants to be able to say to searchers, “These are the businesses nearest to you that not only meet your search intent but come highly recommended by other customers who have made the same search”. You shouldn’t just be thinking about Google My Business reviews. Search engines are also likely to rank other positive online reviews of your business higher in local searches if they include your business NAP. For example, if an article on a beauty blog includes reviews of the ‘Top ten hairdressers in Newton Abbot’ or you have positive reviews on your Yell profile, these are likely to appear high in search results too. This is slightly different to the social proof that you would want to generate for organic SEO purposes. Search Engine Watch defines social proof as “the attempt to build credibility and trust towards your business by showcasing what others think of it. Instead of promoting your business on your own, you are doing it through others, whether they are experts, celebrities, or simply your customers, helping a new audience discover your product”. Reviews are just one element of social proof and can be generated via a range of sources such as Facebook, booking.com, Amazon, Goodreads, TripAdvisor and many others, depending on the nature of your business. Logos of clients, endorsers, governing bodies, etc. Again, these should all improve the rankings of local businesses but they may have less direct impact on local SEO than reviews that are clearly attached to your business name, address and phone number. As I mentioned above, the Bright Local Consumer Review Survey 2016 found, once again, that people think reviews lose their relevance after three months. Therefore, it’s important for businesses building their local SEO to bring in a steady stream of positive reviews so that they always have some written within the last three months. Consistency and recency both signal that your business is active, engaged with customers and currently doing a good job. People like recent reviews because the chances are that they relate to your current staff, ethos and offering rather than referencing the golden days of your business or, conversely, a time when you were going through a sticky patch. In addition, reviews help people to form an opinion about whether to buy from you at a glance. Again, fresh content does matter to local SEO but less so than it does to organic SEO. A searcher with local intent will be looking to see whether other people have had a good shopping experience. They’ll be less worried about when you last updated your blog or posted a new news story because those things won’t directly affect what it’s like to buy from you at that given moment. When it comes to local SEO vs organic SEO, the main difference for you and anyone involved in your SEO strategy is understanding who your customers are and what their search intention is likely to be. For example, if you run a restaurant your customers may be looking for a good night out with friends or family that’s close to home so that they can enjoy a drink without worrying about a long or difficult journey afterwards. They will want to know that other people have come and enjoyed the food and that it fits within their budget; they’ll also be interested in the menu and potentially want to pre-book. If they haven’t been before, they’ll want to know where you’re located. They may even find you when they’re looking for a nice spot nearby to have lunch while they’re out shopping or taking a break at work. They won’t want to know about a restaurant in the next town or county along. Your priority, therefore, will be to optimise your online presence around your location. On the other hand, if you run a social media management business, you may want to attract clients from all over the world – these days, Skyping a client in New York is the next best thing to a sit-down meeting. Potential clients will be less concerned about your location and more focused on whether you have the knowledge, experience and capacity to take over their social media management. In this case, your priority would be on ranking highly for the keywords and long-tail phrases clients might use to find you, as well as creating fresh content to demonstrate your expertise and social proof such as testimonials and case studies showing the positive difference you’ve made to other businesses around the world. As I said in my introduction, both approaches are about creating a fantastic user experience that reflects the end user’s needs and answers the purpose of their search. If you can keep that in mind, both your local and organic SEO will flourish. If you enjoyed this post and found it helpful, we’d love it if you shared it – thank you, it’s very much appreciated. Thank you Christine… that’s super lovely to know!